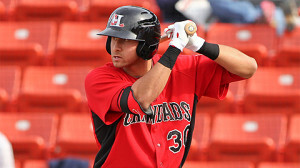 Texas Rangers prospect Joey Gallo has showcased excellent power this season for Low Class-A Hickory, which has been displayed over his past five games where he has slugged six home runs. In the first game of a doubleheader on Tuesday, Gallo went 4-for-4 with three home runs and four RBI. He would follow up with a 2-for-5 two home run performance the following day in the second game of yet a second straight doubleheader. In 64 games this season, Gallo has slugged 20 home runs and 37 RBI, however, he holds onto a .236 batting average and has struck out 102 times in 272 plate appearances. Although Gallo has been privy to the strikeout this season, Texas remains focused on his talented display of power, which is not an easy find. Gallo is still only 19-years-old and should have plenty of time to work on his weaknesses at the plate. A first-round pick (39th overall) by the Rangers in the 2012 MLB Amateur Draft, Gallo played in 59 games last season in rookie league ball, split between the Arizona Rookie League and Short-A Spokane. Gallo was impressive in his first professional season, slugging 22 home runs and driving in 52 runs to go along with a .272 batting average. Upon closer look, Gallo’s 2012 is remarkably impressive for an 18-year-old, as he set the Arizona Rookie League home run record with 18 in 43 games, for which he was named the Player of the Year of the league. The Rangers are impressed by this young slugger’s power potential and are willing to look past the strikeout issue (which they intend to fix with further development of Gallo’s overall game), as is explained by the Rangers’ director of minor league operations, Jake Krug. For now, Gallo remains at Low Class-A Hickory and will most likely continue to put on an offensive clinic with his electric, powerful bat.